All of which leaves many newcomers to teaching — and some classroom veterans — wondering: Can’t instructors just lecture sometimes? Can’t we ever just tell students what we know? Of course we can, but it’s important to know what telling is good for — and what it’s not. If we can better understand the problem with relying too much on lecturing — or “continuous exposition by the teacher,” as Derek Bruff, director of Vanderbilt University’s teaching center, called it — then we can better situate lectures within a mix of teaching practices. When to “tell,” and when not to. Telling is an excellent method of communicating specific information, and there are plenty of occasions when our students need specific information. To communicate important facts, to illustrate a concept with a story of its application, to explain the historical origins of a conflict, you can take the easiest route from A to B and just tell (i.e., lecture) your students. What telling is not good for: teaching students complex ideas, conceptual knowledge, or difficult skills. It’s also true that the best students — ones who have developed good note-taking skills — can learn quite a lot from a lecture. But to reach more than just the best students, we need to do more than just tell the class information and expect everyone to understand and put it to use. A short lecture on those very topics will be that much more effective after students first try to solve the puzzle on their own. Naïve tasks work well because they reveal to students the gaps in their knowledge — gaps that your lecture can fill. Or take a page from the naïve-tasks concept and have students attempt the quiz before the lecture, thus revealing to them all that they don’t know. Then give students a chance to change their answers as they learn from your lecture. For those of you asking about audio recording apps to use on iPad, here is a list of some of the best options out there. Whether you want to record a lecture, an audio note, a memo, or simply capture ideas and thoughts as they happen, the apps below provide you with the necessary technology to do so, and in the easiest and most effective way. Video has become as ubiquitous in higher education classrooms as big screens in the fitness center and Hulu in residential halls. The use cases abound. The most popular use right now is to help with remote teaching and learning; 73 percent of institutions in a recent survey report the use of video for that purpose. That’s followed by the showing of video in classrooms (70 percent), as supplementary course material (66 percent) and for lecture capture (65 percent). But video is also gaining steam in student assignments, teaching skills and recording students as they practice them, recording campus events for on-demand viewing, as part of library media collections, to deliver personal introductions and to give feedback on student assignments and instructor teaching practices. These examples aren’t the only ones cited in the latest results of Kaltura’s “The State of Video in Education.” The 2017 survey, done in May and June 2017, drew responses from more than a thousand people, 81 percent of whom work in higher ed (the rest from K–12 and other educational organizations). Most of the survey respondents hold one of four primary roles: instructional design, IT, faculty and media. Kaltura is a company that sells video products and services. Most faculty in our second annual Teaching with Technology Survey said they employ a mix of online and face-to-face instruction, and many are using the flipped model in their courses. 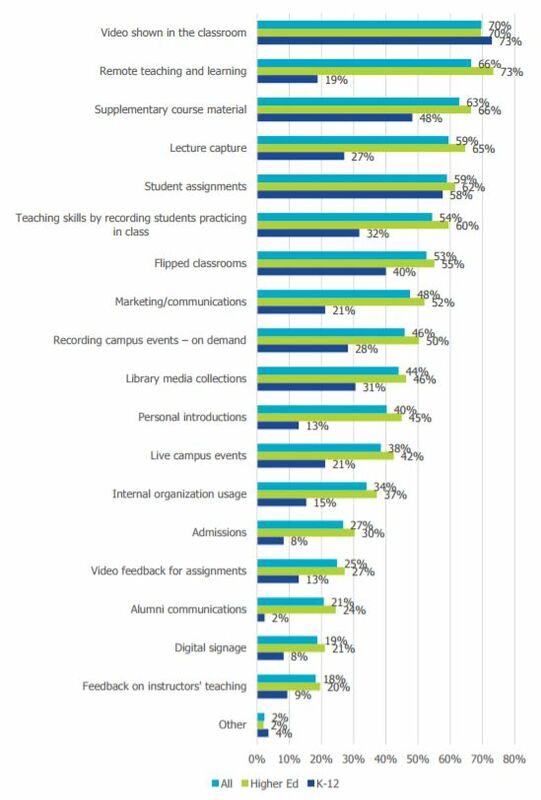 In a nationwide survey on the use of technology for teaching and learning, an increasing number of higher education faculty members said they employ a mix of online and face-to-face learning in their courses. A full 73 percent of respondents said they use the blended model — that’s up from 71 percent in 2016. 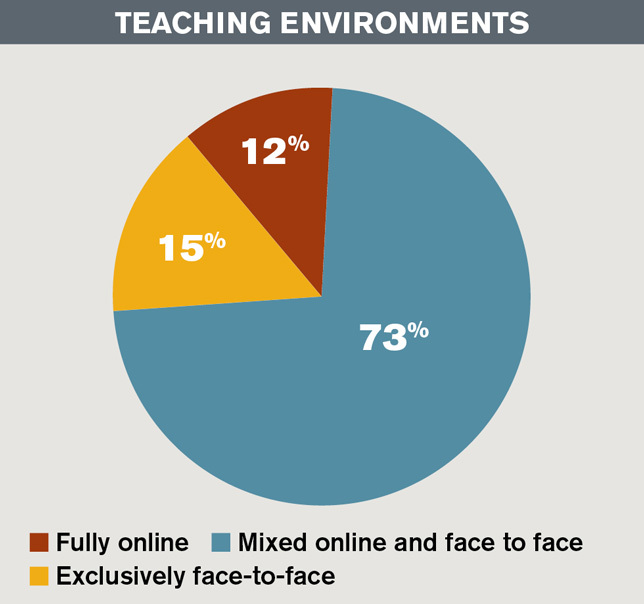 And while 15 percent of faculty are still teaching exclusively face-to-face, 12 percent have gone fully online (an increase from 10 percent teaching online in 2016). 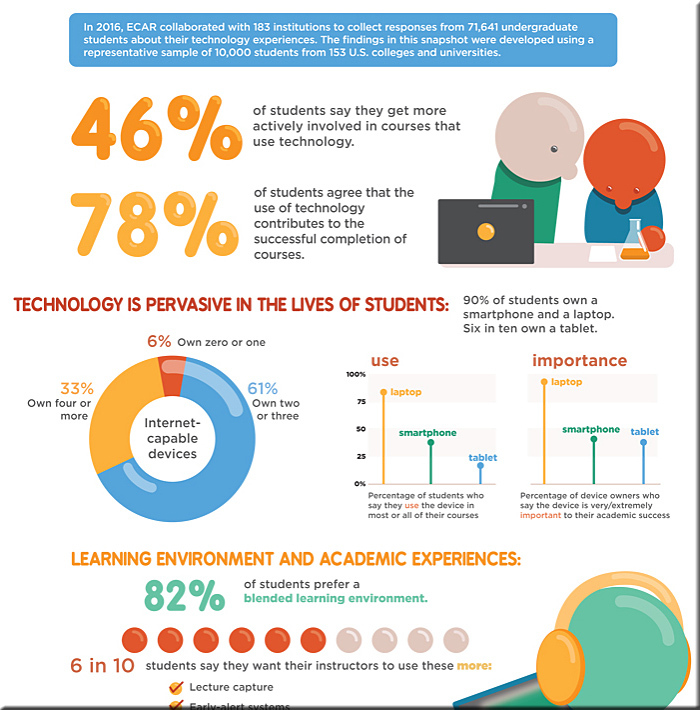 Those findings came out of Campus Technology‘s 2017 Teaching with Technology Survey, in which we asked faculty to dish on their approach to teaching, use of technology, views of the future and more. The vast majority of the lessons being offered within K-12 and the lectures (if we’re going to continue to offer them) within higher education should be recorded. Well…first of all…let me speak as a parent of 3 kids, one of whom requires a team of specialists to help her learn. When she misses school because she’s out sick, it’s a major effort to get her caught up. As a parent, it would be soooooo great to log into a system and obtain an updated digital playlist of the lessons that she’s missed. She and I could click on the links to the recordings in order to see how the teacher wants our daughter to learn concepts A, B, and C. We could pause, rewind, fast forward, and replay the recording over and over again until our daughter gets it (and I as a parent get it too!). I realize that I’m not saying anything especially new here, but we need to do a far better job of providing our overworked teachers with more time, funding, and/or other types of resources — such as instructional designers, videographers and/or One-Button Studios, other multimedia specialists, etc. — to develop these recordings. Perhaps each teacher — or team — could be paid to record and contribute their lessons to a pool of content that could be used over and over again. Also, the use of RSS feeds and content aggregators such as Feedly could come in handy here as well. Parents/learners could subscribe to streams of content. Such a system would be a huge help to the teachers as well. They could refer students to these digital playlists as appropriate — having updated the missing students’ playlists based on what the teacher has covered that day (and who was out sick, at another school-sponsored event, etc.). They wouldn’t have to re-explain something as many times if they had recordings to reference. Also, within the realm of higher education, having recordings/transcripts of lectures and presentations would be especially helpful to learners who take more time to process what’s being said. And while that might include ESL learners here in the U.S., such recordings could benefit the majority of learners. From my days in college, I can remember trying to write down much of what the professor was saying, but not having a chance to really process much of the information until later, when I looked over my notes. Finally, learners who wanted to review some concepts before a mid-term or final would greatly appreciate these recordings. Again, I realize this isn’t anything new. But it makes me scratch my head and wonder why we haven’t made more progress in this area, especially at the K-12 level…? It’s 2017. We can do better. If you’re going to share and interact with your students in the electronic and physical spaces (as you should), you must learn how to screencast. Screencastomatic: This is my go-to app. It’s free, but I pay a few dollars for the pro service because I love it, it gives advanced editing features, and I can download to Dropbox. You can see that my YouTube tutorials are recorded with this. Explain Everything: This app, available from iTunes and Google Play, remains a top tablet app in the U.S. It’s perfect for math screencasting. Swivl: It’s a robotic stand for your iPad, iPhone, or Droid. When you use the iOS app, Swivl will film and capture everything. It can also follow you without an app, so you could set another device on record and then just put it in the stand. Swivl lets you record speeches, or helps you evaluate your own teaching. Having a Swivl in your classroom changes everything. You just put the controller in your pocket or around your neck, and it follows and records you (mic in controller). I’ve been demoing this for two weeks and can focus on teaching rather than recording. Right upfront, I want you to know that I am not being paid for this posting. 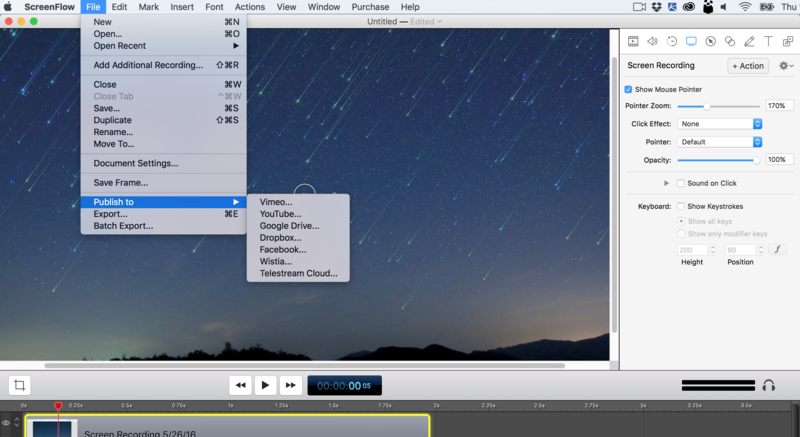 Rather I want to pass along some valuable information for those folks out there who want a powerful screencasting and video editing tool for the Mac. You should check out ScreenFlow from Telestream.net. 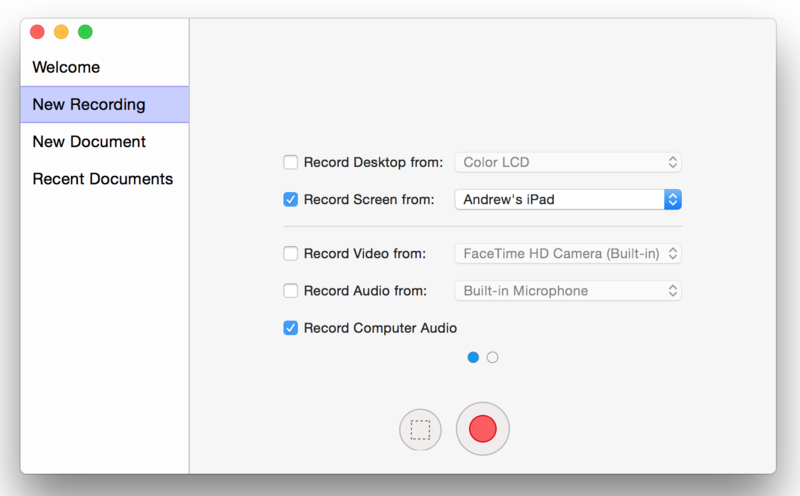 The tool can record your desktop, your iPhone, and/or your iPad as well as can record audio from multiple sources. 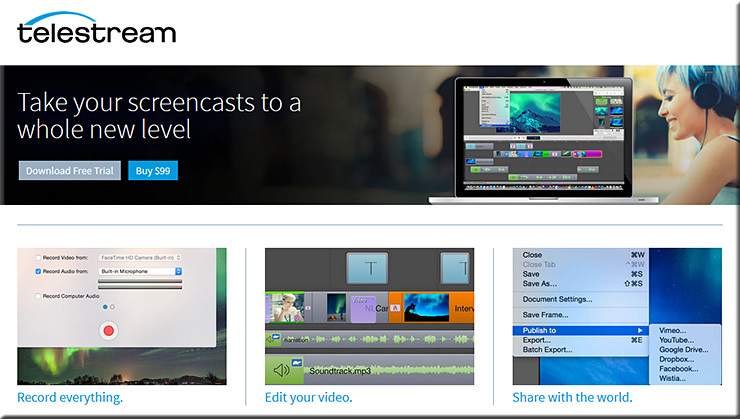 Screenflow is award-winning, powerful screencasting & video editing software for Mac that lets you create high-quality software or iPhone demos, professional video tutorials, in-depth video training, and dynamic presentations. 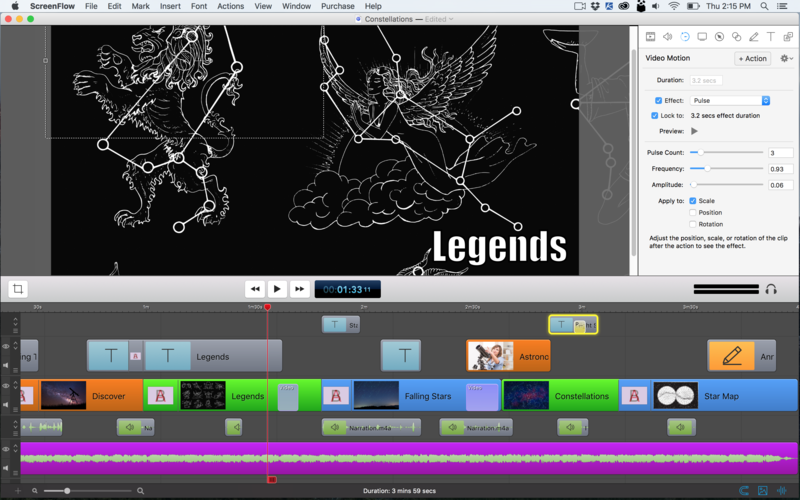 The timeline-based editor reminds me of the editing interface within iMovie 6 (one of the most intuitive interfaces I’ve seen in iMovie throughout the years). 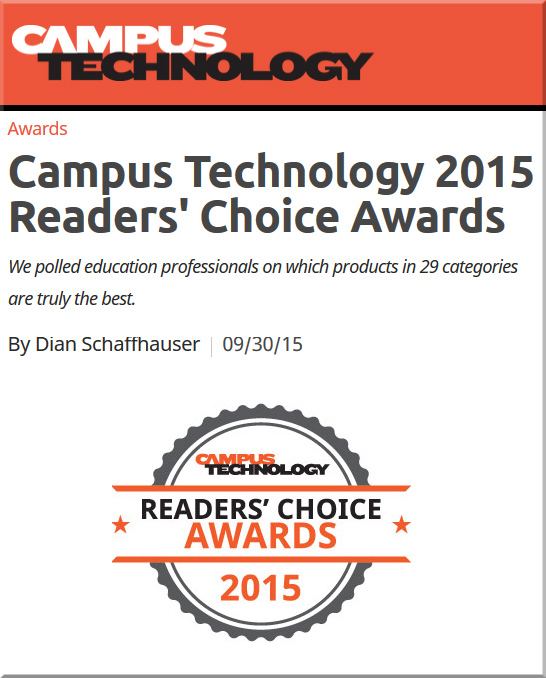 In our Teaching & Learning Digital Studio at Calvin College, the feedback from clients has been very positive. It’s a solid tool; check it out.